A house can become over-pressurized in many different ways. For instance, localized over-pressurization can occur when a portion of a house is finished off, but the return air vents are omitted. Supply air continues to enter the room, but since no means of air escape was provided, the room "over-pressurizes". This is a very common occurrence I see on a regular basis, especially when a "do-it-yourselfer" finishes his own basement. One of the dangers of an over-pressurized house, is that moisture-laden air will be forced into the exterior wall or ceiling cavities, where it will eventually reach the dew point and begin to condense. Once the interior wall & ceiling components reach a certain moisture level, they are susceptible to mold growth. Many components, such as insulation, will cease to provide their intended function if they become saturated, and must be replaced with new. Click on the thumbnail image above to see an expanded view of a wall section in an over-pressurized house in the winter. As you can see from the image on the left, you will typically find the highest moisture levels and the most interior wall damage towards the outside 2/3 of the wall, in an over-pressurized house in the winter. Click on the thumbnail image above to see an expanded view of how over-pressurization has forced moisture up into an attic, where it has frozen on the underside of the roof decking. Moisture-laden air is forced up into a poorly ventilated attic, freezing onto the underside of the roof decking. 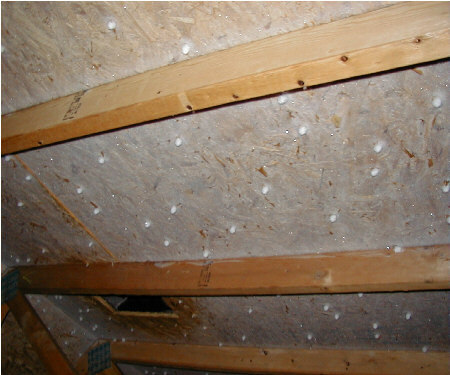 During the first warm day, the ice will melt and drip onto the insulation and drywall ceilings below. In severe cases, the insulation and drywall is so damaged, it requires replacement. Click on the thumbnail image above to see an expanded view of how moisture forced up into a poorly vented attic space, has lead to mold growth on the structural members. 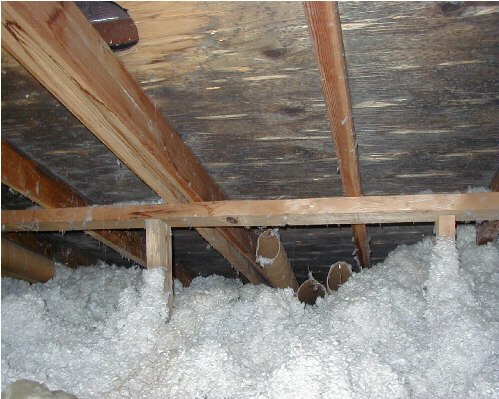 This photo shows the attic of a house described in "Upgrading An Existing Home". The damage here could be directly attributed to not properly upgrading attic ventilation in conjunction with upgrading the exterior "shell". Notice the extensive mold growth on the underside of the roof decking. A house can become de-pressurized in many different ways. For instance, a wood burning fire-place that has not been installed with a proper source of make-up air can easily consume over 300 - 500 cfm (cubic feet per minute) of indoor air. Not only is this very inefficient as the air being consumed by the fireplace is expensive air (has already been warmed to indoor temperatures), but also can very easily draw more air out of a house than is being returned. Localized and house-wide de-pressurization can also take place through the use of any out-exhausting mechanical ventilation (i.e. bathroom fan, kitchen range hood fan, etc.). While these appliances are certainly useful and necessary, their operation without corresponding fresh air return into the house will create a de-pressurized situation. Click on the thumbnail image above to see an expanded view of a wall section in a de-pressurized house in the summer months. As you can see from the image on the left, you will typically find the highest moisture levels and the most interior wall damage on the inside 1/3 of the wall, in a de-pressurized house in the summer. The charts below help to illustrate some key principles associated with air-flow and air-pressure, and the potential for hidden moisture problems in a structure. There is the potential for hidden moisture problems. There is little risk of hidden moisture problems.